The thicker the shoulder strap, the more support it gives; this is crucial for full figures (D cup and up). Also, straps should be adjusted to stay put without pressure or cutting. 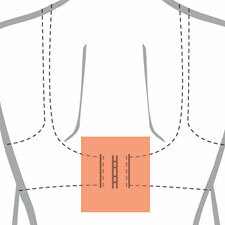 A bras cups should completely contain the breasts and fit smoothly, with no bulges at the top, sides, or bottom. The ideal bra is one with molded cups; they’re the least visible underneath clothes, and they offer the most support. Don’t ignore seams. They actually provide a lot of support. Test for fit. Proof of a good fit? When you sit down, the position of your bra doesn’t change. The center of the bra (the piece that connects the two cups in the front) should lie flat against the breastbone, without leaving a gap between the torso and the bra. If it protrudes in the center, the bra is too small; try a larger cup size. They should relieve shoulder stress from bra straps by adding support below the breast. Also, they should fit to the rib cage and not cut into breast tissue. The back strap should be completely straight and rest at or below shoulder blades for maximum support. If its riding up, the bra is too big. If it feels tight, 75 percent of the time a larger cup size is needed, not a larger bra.